You won’t compete with many other people for the job, unless you apply in a prestigious club or hotel that pays the hostesses twice as much as they normally earn. There will always be some vacancies available in the city. If you do not make it in your first interview, you can try your luck in the next hotel, or restaurant. Some places are always on a look for new hostesses. The interview for this position does not belong to the difficult interviews. You will typically face less than ten questions, and most of them will be relatively easy personal questions. Why do you want to work here, and not somewhere else? How do you imagine a typical day in work ? Did you have this job before? When I interviewed someone for a position of a host/hostess, typically after first three minutes of talking together I knew whether we’d hire them or not. Easy as that. Three minutes are enough to evaluate the communication skills of the person, to see how they conduct themselves. After three minutes you know whether it is a pleasure to talk to them, whether they have some charisma, and basically whether they have what it takes to be a good host/ hostess. This position does not require any experience or formal education. Once you convince your interviewers of your motivation, and right personality for the job, they will give you a chance. Only in the prestigious clubs and hotel chains, basically in places where the recruitment is more sophisticated, and where they have a big pool of job candidates to choose from, they will use some behavioral interview questions and possibly even some personality tests when hiring new employees. They have to do it to choose only the best. In any other cases, you can count only with a few personal questions. Your answers to them are enough for us to decide the outcome of the interview. Try so say something nice about the place. In an ideal case you should dine or have a drink with friends at the place, and look for things you can praise later in your interview. Perhaps the people were extremely nice, or you enjoyed the food, or you like the locality, or atmosphere. Or they have great reputation on social media, or anything else. 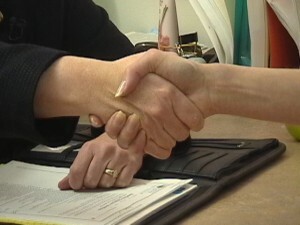 Obviously most of us do not care much when applying for the job, and we will take any offer that pays well. But in an interview you should point out at least one thing that differentiates them from their competition. And if you can not come with anything better, say that the place is close to your apartment, and that is the reason why you decided to apply with them, and not with some other dining facility. This can be, but doesn’t have to, the first question in your hostess interview. Try to stay relevant in your answer, and talk about things that matter for the employer. In general, hostesses are responsible for the following duties: welcoming and greeting guests, escorting them to the table or to their room, presenting the menu and answering their questions, sometimes also taking reservations and other duties. But the duties can differ. One way or another, you should show the interviewer that you do not plan just to hang around, or play with your smart phone. Show them that you like to be busy, that you will keep your eye on the guests, and always look for an opportunity to make them feeling great and welcome. This question is a bit tricky. Since if you had the job before (and do not have it anymore), many interviewers will ask why you left the place. And if you happen to change your place of work every three months, it will be a showstopper for most hiring managers/restaurant owners. You should think twice about your answer. If you had the job before, and left the employer on good terms, feel free to talk about it in your interview. What is more, elaborate with the list of your duties, and tell them about the principal things that you learned in this job (if any). Experience definitely helps. If you happen to have a written recommendation from your past employer, this is the time to take it out of your bag and show it to the interviewers. A simple board on a wall says: We look for a hostess. Apply inside. No more info is provided, and you have no chance to guess how much they are willing to pay you. You have two options for a good answer at this point. First option is to say that the salary is not a deciding factor for you, and that you will accept the same amount as they pay to other hostesses that work in the restaurant/hotel. This is obviously good, and you can go for this answer if you are a student, or someone who’s not on a budget. But what to do if you need to earn a certain amount of money, to be able to pay your bills? In this case, I suggest you to be honest. Do your math and count how much you need to earn per hour, or in a month. Say the number, and try to back it up with something (saying that some hostesses earn that much in the city, or that according to average salary stats on the internet you consider your claim reasonable). If they hire you, great. If they say it is too much, you can try lowering your expectations. And if they start laughing and send you away, you may reconsider your expectations altogether, or look for another job that pays better. You won’t deal with these questions unless you apply for a hostess job in prestigious restaurant, club, or a hotel chain. Behavioral questions help us to understand more about your attitude to work, to your colleagues, and to various situations that happen in your daily job. In my opinion it makes no sense to ask these questions if we have just two or three job candidates, and interview them for a basic hostess job. Describe a time when you went above and beyond with your service for a customer. Describe a time when you felt overwhelmed in work. How would you deal with an angry (aggressive, upset) client? Special Tip: Behavioral questions are advanced. 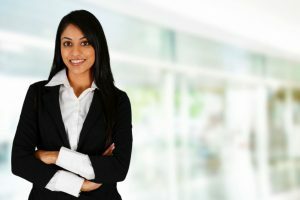 If you think that you may face them in your hostess interview, and do not know how you’d answer them, consider having a look at our Interview Success Package, where you will find all the answers. 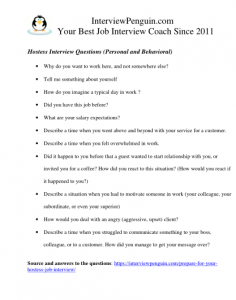 Interview for a hostess position belongs to easier job interviews. You will typically face only a few personal questions. If you make a good impression on your interviewers, they will typically hire you. At least they will give you a chance to prove your abilities. Try to show enthusiasm and motivation. Try to be a nice companion. Check the questions again, and practice your answers. And if you happen to apply for a job in a high-class restaurant or hotel, try to prepare also for behavioral questions, since you won’t avoid them in this case.